Manila, Philippines - Manny Pacquiao's mother, Mommy Dionisia has been the hot topic on social media after the Filipino pride defeated the American boxer Timothy Bradley on Sunday at the MGM Grand Garden Arena. USA Today reported that Manny Pacquiao’s mother, Dionesia Dapidran-Pacquiao, was just as entertaining as the action in the ring. As the camera was zoomed in to her, she appeared holding a rosary but commentators and netizens speculated that she may have been putting some curse on Bradley. She instantly became a Twitter sensation. As of press time, "Mommy D" is still one of the top trending topics in the Philippines and worldwide. 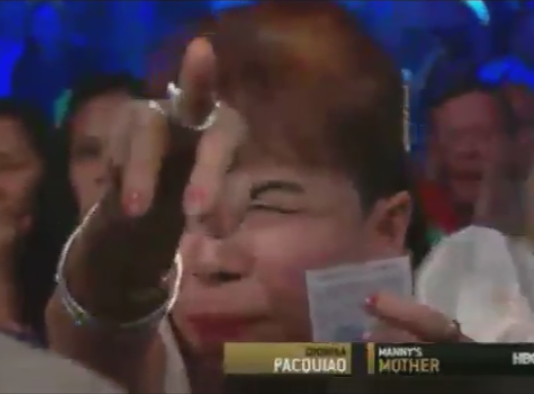 Some netizens said that Mommy D was the star of the latest boxing fight. panalo ang orasyon kanina ni mommy D! hahahha HIGH LIGHT ng labang Manny-Bradley! Y'all can make insulting memes about Mommy D but at the end of the day, she's still enormously rich while u are still just a troll.